In Auditory Ace you are tasked with remembering the values of multiple playing cards. The objective is to determine if the current playing card details match the card information that was presented to you a certain number of steps back. Firstly, the number of cards that are presented to you will depend on the level of difficulty that you are training on. In simple levels, there will only be two cards while as you improve, the number of cards will increase and that’s when the challenge starts. For the sake of this tutorial, let’s assume that we are dealing with 4 cards. When you click START you will hear the details of a card (suit, value or both) while the card is being pulled from the deck. To explain this better, let’s assign a number to each of the 4 positions that holds a card as you see below. When a new card is pulled from the deck, it will always go to position 1. And the card that was in position 1 will move to position 2. The card in position 2 will move to position 3 and the card in position 3 will move to position 4. They keep rotating as new cards are drawn. You will be ready to play when the very first card drawn moves to position 4. At this time, you should remember the value of the card in position 4 and determine whether it matches the card in position 1, which was just announced and placed in position 1. You will now respond to whether the cards in positions 1 & 4 match by using the ‘Yes’ or ‘No’ buttons. You will use either the left and right arrow keys on your keyboard or touching the buttons in case of touchscreens. 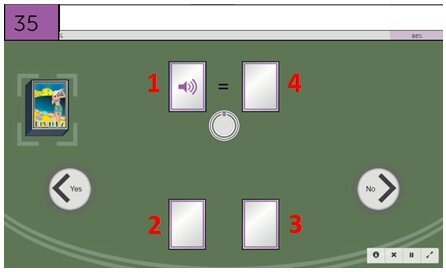 Once you respond using the buttons, the card in position 4 will turn to reveal its value. The number of items to remember in the sequence increases. The information to remember for each item changes (suit, value, both). The card information is presented faster.